DON'T JUST SIT THERE. PICK SOMEONE. The theme of this year’s conference is “Authenticity: The Power of Being You.” Race, Gender, Diversity: The most important conversation for women in corporate America. You will have an opportunity to network with other Asian women professionals and be inspired by each other. This will mark the beginning of a long-lasting relationship with AWLN and a commitment to your own professional and personal development. Take responsibility for your career destiny, and join us at the Working Mother Media Best Companies for Women of Color Multicultural Conference. The AWLN Founding Sisters Circle is a core group of 100 mid to high-level women in both the public and private sectors dedicated to the advancement and leadership development of Asian women. The AWLN Founding Sisters signal a next stage of growth for AWLN, as we enter into a phase of institution building and membership expansion. As role models for our national membership, our 100 Founding Sisters will lead the development of future Asian women leaders, increase their public visibility, and expand AWLN’s resource and fundraising capacity. Click here for more information on the nomination process and form. "Lessons from Jenny Ming, President of Old Navy"
On the 22nd of April 2006, the Committee of 100 held its 15th Annual Conference. 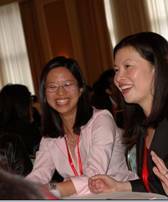 Chinese-American greats such as Jerry Yang and Jenny Ming were not only attendees and active participants but co-chaired this event. The Committee of 100 is a non-profit that seeks to bridge the gap between the US and Greater China. It is made up of a bit over 100 members of the Chinese-American community who have enough prominence to influence relations between the two countries. It’s OK to not have a 5-year plan for your career. This relieved a lot of people at the table. She didn’t know what she wanted in college – she majored in Home Economics but one job led to another. Every new role was a discovery for her. Be honest with people. They will try to help you. When Jenny was in her first managerial role, she sat down with her team to tell them she wanted to do well and needed their help. This made her goals genuine and they helped her. Strike the balance you need. Know what *you* (not your friend or your mom) need to be happy. For Jenny, she did not want to put family on the backburner. While work is a priority, her family is still first. She had her first child at 28. At one point she had 3 children under the age of 2. She’s most proud of her role as a mother. By striking a balance, she also means that if you need to hire help to watch your kids or clean your house, get it. We can’t do everything ourselves! Jenny was such a humble, genuine, warm and positive person. Meeting her and getting insight on how she got to her level really energized me. This year, Jenny Ming launched a new brand of Gap called Forth & Towne, targeted at women. That weekend, I stopped into an Old Navy to see what it would feel like to walk into a store and pretend I was President of it (and then shopped! ).